During a break in the action while playing in an all-star game at Rucker Park in Harlem, New York, earlier this month, Che Evans took a moment to check out his surroundings. As he glanced at the packed stands, Che took a moment to reflect on all of the history that’s been made there. Two years ago, Che was just a typical, tall kid: a nearly 6-foot sixth-grader who just happened to have a love for basketball. Che has grown 6 inches since then, evolving into a 6-foot-6 shooting guard who now hopes his love for the game one day will turn into NBA success. Che Evans Jr. dodges past defenders during the “Hoops Against Violence” basketball game at St. Frances Academy in Baltimore, on Aug. 13, 2016. 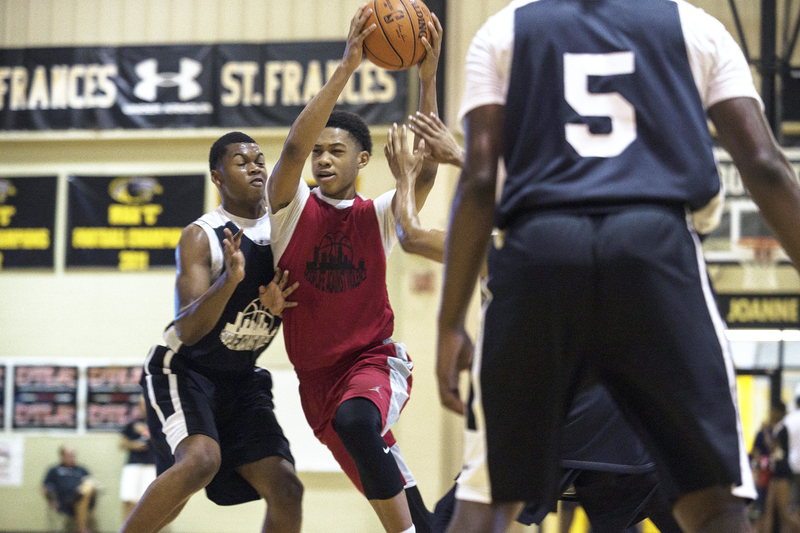 Baltimore high school freshman and rising basketball star Che Evans is already a prospect for college and professional recruits. From a relative unknown at the start of 2015, Che — at age 15 — is now considered one of the top incoming high school freshmen in the country. After a day of signing autographs and posing for selfies with fans at the Rucker last week, Che travels to Brooklyn, New York, this week to play in Saturday’s Under Armour-sponsored All-Star game, which features the top middle school players in the country. Despite the rapid-fire elevation to the spotlight, Che is ready to embrace the moment. His short-term goal: to be one of the nation’s top players when his high school career begins later this year. His long-term goal: to return Baltimore to its once proud tradition of producing quality basketball players, guys such as Carmelo Anthony, Reggie Lewis, Sam Cassell and Rudy Gay. Of that long list of local stars, Che, who has great court vision and the ability to attack the rim using either hand, has a strong desire to be next. In a city that hasn’t seen much recent success with its young stars (rapper Lor Scoota, 23, was shot and killed this summer, and his manager was murdered two weeks later), those in the Baltimore basketball scene are betting on Che. One move was to ignore the lure of historical Baltimore powers such as Dunbar High School and St. Francis Academy and send their son to Dulaney High School in Baltimore County, a place that offered their son a more diverse environment. Che, who lives less than a five-minute drive from Dunbar in East Baltimore, initially wasn’t too thrilled with attending a school outside the city. Eventually, he listened to his parents, though. Both of Che’s parents grew up in Baltimore and know the problems of the city, which were cited in a recent Department of Justice report. Those problems are why both hover closely around their son. That right example includes the willingness of Che to make sacrifices, which he decided to do last summer after emerging as a future star while dominating during the CP3 National Middle School Camp held last summer just before he entered the eighth grade. At the gathering of the best middle school talent in America, Che was named the top prospect. His workouts this summer, after the conclusion of his AAU season playing for Team Melo, have been intense. Che does yoga in the morning, works on basketball drills in the afternoon and trains with weights in the evening. He puts in work five days a week, up to five hours a day. It’s paid off. Che was the best player during the Future150 camp in Houston earlier this summer, turning heads when he posterized a helpless opponent. In January Che was invited by St. John’s — along with other high school recruits — to attend a basketball game. And even before setting foot in a high school classroom, schools such as Arizona, Kansas State, Kentucky, Maryland and UCLA have shown an interest in recruiting him. Che has earned everyone’s respect. During that recent all-star game at the Rucker, he played in the high school game, even though there was a middle school event. Now that he has a reputation, he’ll find that challenge each time he takes the court. Che’s word of advice to his challengers: Bring it.